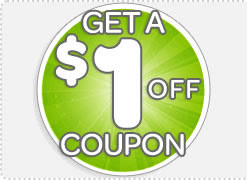 Centsible Savings: $1.00 coupon for any purchase on Ebay! Go here to signup to get daily deal alerts from Ebay. The first 100,000 people to sign up will get a coupon good for $1.00 off any purchase off Ebay! (The coupon will come in the My Ebay section of your account a week or so after registration.) You could very easily score something for free since there are many things listed on ebay for a $1.00 or under.